Normally, an isometric drawing is positioned so that the front, top, and right side views appear, as shown in figure 37 (on the following page). This may be varied according to the position that the draftsman feels best shows the object. Dimensional values are transferable from orthographic views only to the axis, or lines parallel to the axis, of isometric drawings. Angles and inclined dimensional values are not directly transferable and require special supplementary layouts which will be explained later (page 50, paragraph 2b) in this task. Isometric drawings do not normally include hidden lines, although hidden lines may be drawn if special emphasis of a hidden surface is required. FIGURE 37. THE RELATIONSHIP BETWEEN THE FRONT, TOP, AND SIDE VIEWS AS DRAWN ORTHOGRAPHICALLY AND ISOMETRICALLY. a. Normal Surfaces. 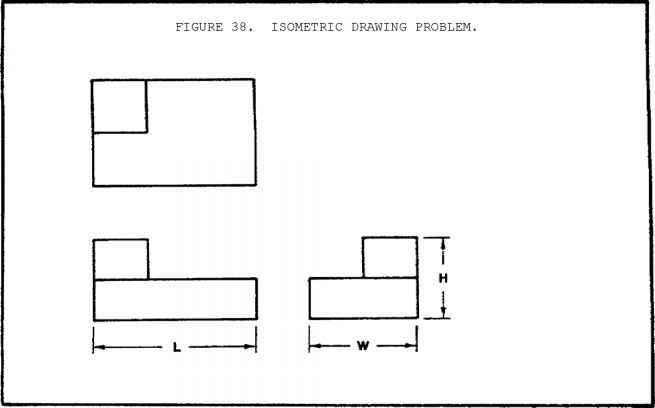 Figure 38 (on the following page) is a sample problem that requires you to create an isometric drawing from given orthographic views. 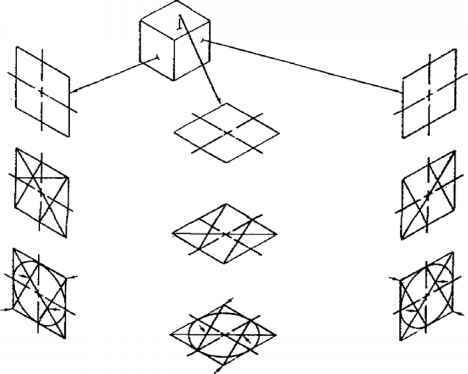 Since all surfaces in the problem are normal (90° to each other), all dimensional values may be transferred directly from the orthographic views to the isometric axis, or lines parallel to the isometric axis. The basic height, width, and length of the object are 1 1/2, 2, and 3, respectively, in both the isometric and orthographic drawings. In figure 38 we are given the front, top, and side views of an orthographic projection. Our task is to draw an isometric drawing from this information. Step 1. Make, to the best of your ability, a freehand sketch of the solution. 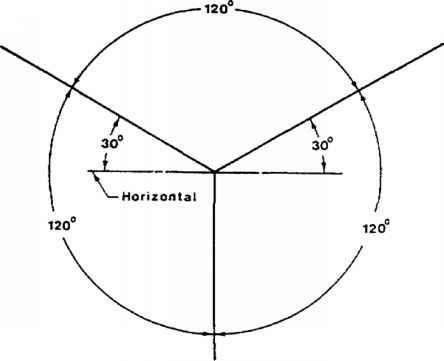 Remember that since it is easier to make corrections and changes on a sketch than on a drawing, you should make your sketch as complete and accurate as possible (figure 39, view A). Step 2. Using very light lines, lay out a rectangular box whose height, width, and length correspond to the height, width, and length given in the orthographic views (view B). Step 3. Again, using very light lines, lay out the specific shape of the object. Transfer dimensional values directly from the orthographic views to the axis, or lines parallel to the axis, of the isometric drawing (views C and D). Step 4. Erase all excess lines and smudges, carefully check your work, and darken in all final lines to their proper color and pattern (view E). How to draft an isometric drawing? How to draw isometric of geometric compositions? 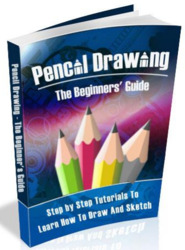 How to draw orthographic drawings? How to make isometric drawings? How orthographic make an isometric? How to study isometric drawings? How to draw orthographic projection by hand? How to learn isometric drawing drafting? 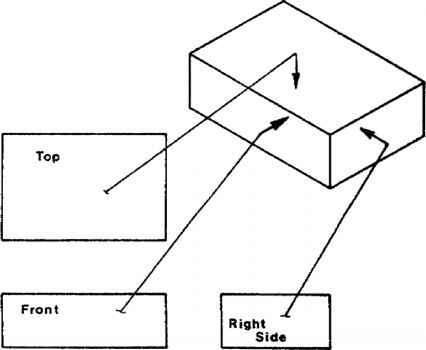 How to draw isometric view step by step? Do the Orthographic Drawing of the Given Isometric Figure? How to draw isometric patterns on computer?